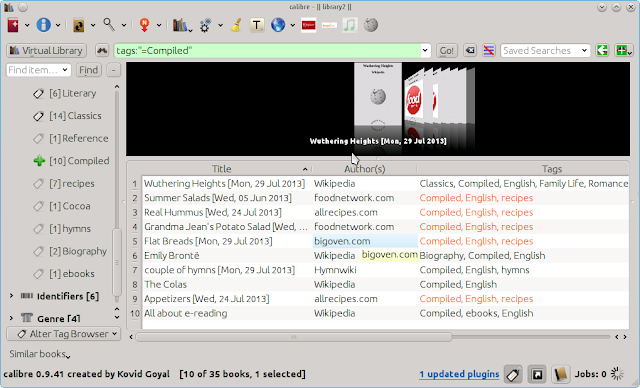 This blog post will discuss a class of plugins that allow you to make ebooks of content from the web, like chosen Wikipedia pages and recipe pages from sites like cooks.com, bigoven.com, foodnetwork and allrecipes as well as the calibre virtual libraries feature. The internet makes a lot of information available at your fingertips. But sometimes it is too much to take in at once, or not in a form convenient to use. For example taking you laptop to the kitchen to follow recipes from websites like cooks.com, bigoven.com, foodnetwork and allrecipes is not always convenient. However if you could put together a number of recipes from these sites into an ebook and load it on to your ebook reader it would make life a lot easier. There are plugins in calibre that allow you to do exactly this. Plugins for these websites can be downloaded directly from calibre following the procedure described in the section "Getting the find duplicates plugin" of the blog post "calibre plugins: duplicate finder". They can also be obtained from the mobile read website. Just click on Recipe Reader, BigOven Recipe Reader, Food Network Recipe Reader and all recipes Recipe Reader to download the plugin from mobileread or to get details about it. Special Notes: Requires calibre version 0.8.58 or later. Wikipedia has a lot of useful information to offer. Some of their articles are quite long and/or related to many other articles. A plugin exists for creating an ebook for multiple Wikipedia pages. For example you could create an an ebook of the biographies of British writers like Charles Dickens, Bernard Shaw, Agatha Christie and J. K. Rowling from their respective Wikipedia pages and put it on your ebook reader and read about them at leisure or even while travelling. Here is a link to the Wiki Reader plugin page on mobileread. The Ebook created by the plugin will have a table of contents with the main headings being the names of the pages chosen and a substructure same as the table of contents as on the Wikipedia page. The details are similar to the Recipe Reader plugins and available on the Wiki Reader plugin page on mobileread. Virtual libraries allow you to conveniently manage a subset of your library. The virtual library button has been available since calibre 0.9.28. It is at the top left corner of the main calibre window under the main toolbar. This feature used to be called 'Search restriction'. The new virtual libraries are easier to use, but otherwise fulfill the same function. Lets consider an example to explore this feature. In the following example I tag ebooks created by the user (say using the above mentioned plugins) as "Compiled". Say I want to manage my "compiled" ebooks today, fix their metadata etc. I can do that by isolating them in to a separate virtual library. How do I do this? Click on the virtual library icon and in the drop down menu that shows up click on "Create Virtual Library". Now a new window opens that allows you to create a virtual library based on commonly used parameters like Authors, Tags, series etc by just clicking on the appropriate parameter. If you want to create a more unusual virtual library (like books added in last 50 days) you can type in the Virtual library name and Search expression. For details on how to enter search expressions and how powerful these searches can be see the user manual page on the subject. In this example however I have already tagged the ebooks of interest as "compiled", so I just click on "Tags" and a smaller window with all the tags listed opens over the previous one. Now I just select the "Compiled" tag from the list. You can choose multiple tags and create the virtual library with books containing either any or all the tags of choice. Just select the appropriate option. If using a single tag this choice does not matter. So here is the virtual library of compiled ebooks that can now be managed in isolation. The recipe ebooks compiled using the some of the 4 recipe reader plugins mentioned above are tagged in red using column coloring feature discussed here. As you can see there are 5 of them and the tag browser shows that too. where while there are only 5 "compiled" recipes again, the tag browser shows 7. This is because the tag browser shows the number of ebooks tagged recipes in the entire library (compiled or otherwise) and not just those displayed with the "compiled" tag. So, a virtual library is different from a simple search. A search will only restrict the list of books shown in the book list. A virtual library does that, and in addition it also restricts the entries shown in the Tag Browser to the left. A virtual library thus behaves as though the actual library contains only the restricted set of books. You can tell calibre that you always want to apply a particular virtual library when the current library is opened, by going to Preferences->Behavior. If you use the calibre Content Server, you can have it share a virtual library instead of the full library by going to Preferences->Sharing over the net. Hope you found the article useful. See you again when we have big news. I love calibre, thank you. I have one question because I am not sure how to work the virtual library. if I create a virtual library for say - Stephen King, all of the Stephen King books will go to the virtual library, but they still show in the main library. do you think it would be a good idea to delete the Stephen King books from the main library and just leave them in the virtual Stephen King library, or will deleting them from the main, also delete them from the virtual? please let me know. thnx. You cnt delete them from the main library. The virtual library is just a method of organisation but it does not create a copy. it refers tothe book in your main library. if you delete it from your main library it will disappear from the virtual one too. "Now I just select the "Compiled" tag from the list. You can choose multiple tags and create the virtual library with books containing either any or all the tags of choice. Just select the appropriate option. If using a single tag this choice does not matter." How do I select multiple tags for the library? I tried holding down the shift button but this adds every tag between the tags I want to select. Any help very much appreciated. Thank you.